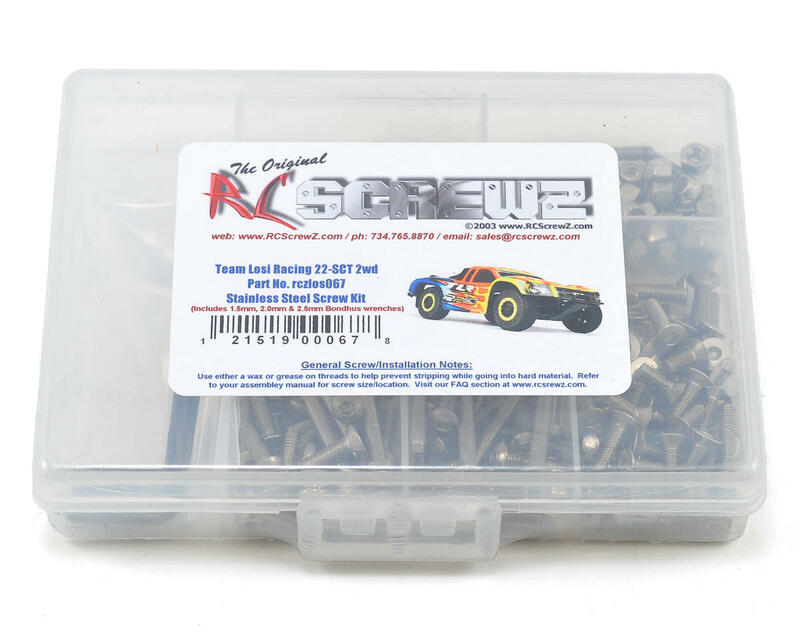 This is an optional RCScrewz Stainless Steel Screw Kit, and is intended for use with the Team Losi Racing 22SCT 1/10 scale short course truck. RCScrewz stainless screw kits are 100% complete. Your kit will include everything needed to do a full conversion and more. Stainless steel screw kits are far superior to the screws that come stock with your RC. RCScrewz kits are made with the best stainless steel money can buy. No more bent, rusted, or corroded screws. Never worry about stripped heads again. You will not find a better screw kit for your RC at any price and RCScrewz Guarantee's it. If for any reason your not 100% satisfied with your kit, return your screw kit to RCScrewz and they will send you a full refund for the price of the kit. Note: Use either a wax or grease on the threads to help prevent stripping while going into new or hard material. Some screws that are included in the kits remain phillips heads but are still stainless steel. RCScrewz has done this for strength, as a result of their field testing, on small diameter screws (2mm and 2-56" dia). This may include some chassis screws and differential screws. All other remain socket head. Please refer to your assembly manual for screw locations. I bought this kit to fix up an abused 22SCT I bought online. This kit made a huge difference in the appearance of the truck. Not only were there enough screws to replace the ones on my truck I had enough left over to replace all the screws on my 22 buggy and a third buggy. Definitely the most bang for the buck and good quality. Highly recommend.